Bring home a star, star magnolia that is. These lovely little trees or tall shrubs don’t seem to be widely used in yards. Yet they are perfect for a small space next to a patio, near a front porch, or you can even grow star magnolias in a large container. My little pink star magnolia tree (‘Rosea’) has been blooming in earliest spring since I planted it as a little whip about 7 years ago. The buds are deep pink, opening to light pink. The flowers end up with a two-tone effect, dark pink on the outside and light pink on the inside. It is now roughly 10-12 feet tall. I consider full size growth in 7-8 years as fast development for a small tree. 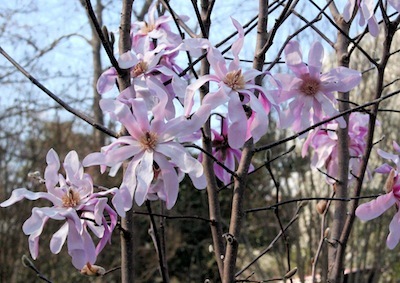 All star magnolias bloom early with a heavy flush of flowers, although there is a newish white flowering Magnolia stellata called ‘Royal Star’ that blooms later and is less likely to be hit with freezing weather. It tolerates hot weather and does well in hot sites as long as it gets enough water. Once the flowers pass by, the deep green leaves will appear. It has a nice dense rounded crown of leaves. The branches need very little to no pruning since its shape grows naturally. The protected branches are also a good spot for bird nests. In the fall, the leaves turn a golden yellow before they fall. I am always looking for more growing room so I removed the star’s low branches in order to increase garden space underneath. Here I planted a couple of overflow hydrangeas and can tuck in some seasonal annuals or bulbs. I also love the smooth silver-gray bark removing the branches helped expose. You should site a star magnolia in a cold spot protected from winds so that it won’t bloom too early. Early flowers and late freezes doom blossoms to brown mush, not what your heart desires in a pretty tree. It thrives in almost all soils, from sand to clay, as long as it receives a good drink of water every week. It will not tolerate wet roots, though. Make sure the soil drains well and stays moist, not wet. Full sun is best but it will put up with some shade. USDA Zones 4-9.